The arrival of the German, World Squash Federation and Paderborn Squash Club flags, dropped into the gardens of the famous Water Castle in Schloss Neuhaus by a parachute team, signalled the opening of the 23rd WSF Men’s World Team Squash Championship in the German city of Paderborn. 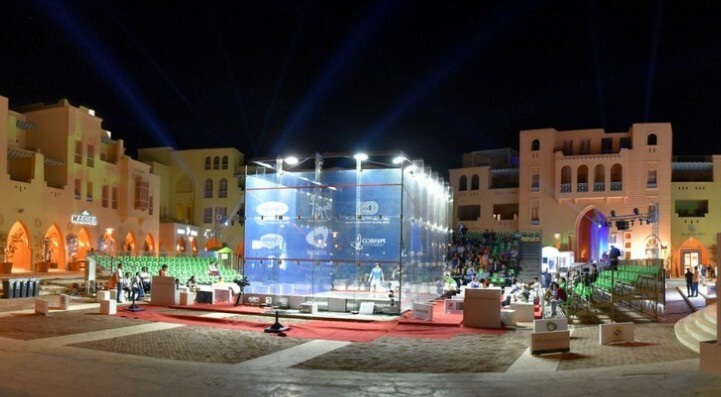 A record-equalling 32 nations are competing for the World Squash Federation title at the Ahorn-Sportpark in Paderborn, from 21-27 August, as the sport presents its first senior world championship since the IOC announcement that Squash is on the shortlist for Olympic inclusion in 2020. After the introduction of distinguished guests – including WSF President N Ramachandran, Paderborn BurgermeisterHeinz Paus and the President of the German Squash Federation Wolfgang Bauriedel – local band Bahn-Orchester Altenbeken led the officiating referees and participating teams into the arena. The long procession was rounded off by hosts Germany, led by championship ambassador Simon Rosner, the German number one who hails from Paderborn. After a performance of the Championship song ‘Somos Estrellas’ by Ritmo 69, Rosner then invited President Ramachandran and Mayor Paus back to the podium to officially declare the championship open.